Rosemary- You can grow that! At the farmer’s market last spring, I was chatting with this charming German woman who sells pastries (wait, is that offensive? like saying “nice smelling eighth grader” implies that most of them stink? am I saying that I don’t expect Germans to be charming? Maybe she’s Austrian? )Anyway, I had bought a rosemary plant at another stall, and she mentioned she had seen a lemon rosemary cookie recipe, and wouldn’t it be great to have lots of rosemary for recipes like that. The hardiest rosemary I have heard of is a variety called Arp, and it is hardy to zone 6. We are technically zone 5, which means we get colder in the winter than it can survive. I say technically, because the zones are changing, with global weirding and all. Zones are determined by the coldest expected temperatures in the winter, and for several years, we have not reached those coldest temps. I have a two pronged approach to growing my rosemary over the winter, so I have enough for those lemon rosemary cookies (you knew it had to be about the cookies, right?) The first prong was to plant the rosemary in a raised bed right by the house which has a frame over it. The bed is sheltered from the wind, and easy to water, but free draining. If the weather gets really bitter, I can put a plastic cover over the frame. Since rosemary is a Mediterranean plant, it wants soil that drains well, cool temperatures in the winter, but not super cold. We have just started a cold snap, with the radio weather people predicting lows “well below zero” for tonight. 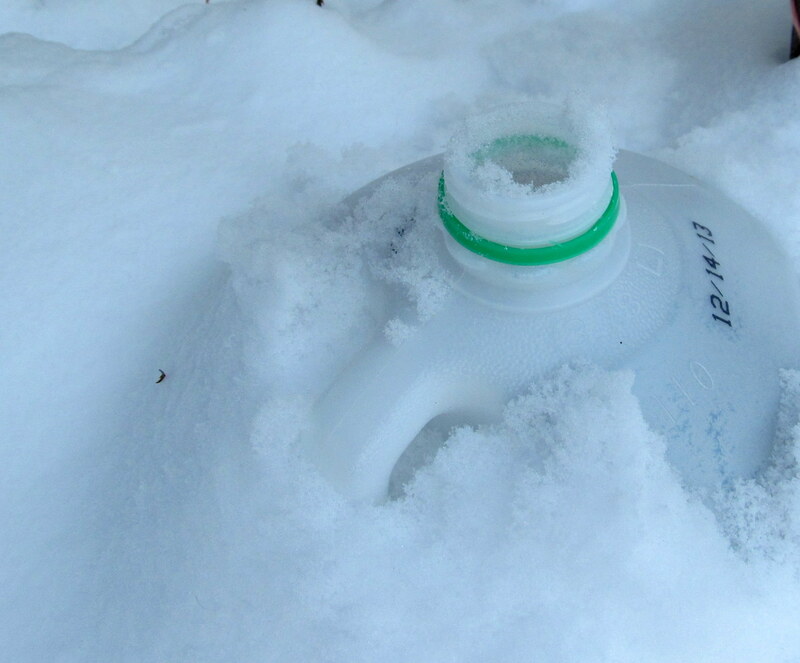 I put a plastic milk jug hat over the plant before it started snowing. are you okay in there, lil buddy? Most windowsill herb kits don’t work well, because most windowsills don’t get enough light. 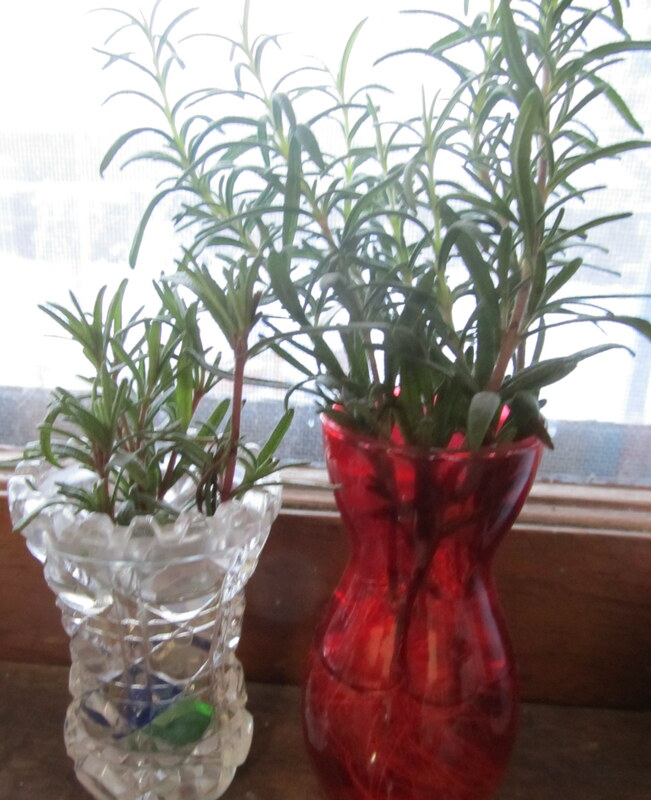 You may see rosemary plants cut into topiaries this time of year, as indoor herbal christmas trees. I would say, if you buy one, cut into it, and make cookies and roast and stuff with it- having fewer leaves will make it more likely to survive the winter in the house. And let me know how the cookies come out. You can grow that is the fantastic idea of C.L. Fornari, who urges garden bloggers to recommend what to grow to people on the 4th of every month. Previous Saffron- you can grow that. No, really! Next Rematch!